Most of the reviewers appreciated the comfortable sole of the GT 2000 5. A handful of runners loved the shock-absorbing cushioning of the 5th version of the GT 2000. The structured Heel Clutch System and the Duomax Support System combine to provide excellent support and stability. The new mesh upper offers better foot-hugging support in this model. The deep vertical flex groove enhance transitions and helps with the flexibility of this well-cushioned shoe. Additional midfoot overlays deliver a wraparound feel in the midfoot, particularly in the arch. Gender specific cushioning gives a slightly softer feel for the women for more comfort. A few wished for substantial weight reduction in the Asics GT 2000 5. A handful of runners needed a break-in period to be very comfortable in this shoe. The GT 2000 series is one of those shoes from Asics that has slowly but surely gained a solid following from runners who require a shoe that blends a well-cushioned run and a supportive ride. In the GT 2000 5, Asics continues this line’s tradition of excellent cushioning, superb arch support, with improved security in the midfoot and the heel. For heel strikers, the 10mm heel offset and the Gel Cushioning system combine to soften the impact with every strike. Asics GT 2000 5: The best GT yet! Another great shoe from the GT series, on the job since 1995! I am pleased with this new version of the Asics GT 2000, a solid Half Marathon/Marathon shoe well suited for a very wide variety of runners. It changed only slightly since last year, with fewer stitches in the upper. Typical of (most) Asics models, quality is the best in the industry. The workmanship is near perfect with no excess glue anywhere. It's not sloppy or hurriedly assembled, the stitching under the sock liner is well done and the entire shoe is put together perfectly. Out of the box, they may feel a little heavy and a bit stiff, but these factors seem to make no difference once you are on the road. This all translates to a safe and confident feel, something I call the hard to describe BMW Factor. It is hard to believe that a minor change in the upper overlays could make such a difference in the way a shoe rides, these GT2000-5 shoes run quieter than the previous version. Running in 32 degrees Fahrenheit weather with regular cotton socks is comfortable. Still the best forefoot cushioning/response of any shoe I have tried. These shoes come as close as any to getting everything right. Excellent grip for such a long wearing shoe, but with no front reflectors, this shoe is a candidate for reflective shoe laces or stick on reflective material such as 3M. I am glad I did not wait until the year-end sales, this shoe is a great value even at full price. A great shoe from the last century and they didn't have to make it yellow or orange in color to show it off or stand out. I am pleased with the best GT 2000 to date! I am also glad that they have not ruined the toebox as Asics has done in the latest GT 1000 and the Kayano models where there seems to be no toe box left, in favor of manufacturing swiftness and 3D printing. If they ruin the GT 2000 next year, I will try to find refuge in the Asics Fortitude model, or simply go back to Brooks. Run Safe. Think Positive. Go Run! Many of us are reluctant to buy the more expensive running shoes when shopping, opting for the more affordable models ( GT 1000 or GT 2000 ) and are left wondered how much better we could run with a real top-of-the-line model such as the Asics Kayano. I will attempt to help you discover if the Asics Kayano 24 is worth the 30% higher price than the GT 2000 5. This is not a review or comparison about the newest or most stylish, it is about value and performance and what we get for the much higher price. Both models are from Asics, a company founded in 1949 and today there are more runners at many of the world's major races wearing Asics than any other brand. Both the Asics GT 2000 series and Kayano versions are "stability road running shoes" that are well engineered and of high quality. Both models are well tolerated by most neutral runners in addition to those in need of a little stability. Stability is provided by having a higher density foam on the medial side of each shoe to help "stabilize" your foot by limiting how much your foot rolls inward with each step. However, the Gel is what makes these shoes work, Asics Gel distributes the forces of landing away from your foot, not straight back at your foot but more to the sides. There is also a piece of plastic located at the arch on the bottom of each shoe in both models that Asics calls the "Guidance Trussic System" added for stability by minimizing torsional twisting. So each model has stability features, like guardrails on a mountain highway, they are there if you need them but not affecting your ride otherwise. The GT and Kayano shoes are for medium arches and not for flat feet, some ads state medium to high arches. GT and Kayano lacing system use independent eyelets for comfort especially if you tie your laces tight. The heel area of these models have AHAR (Asics High Abrasive Rubber) which is harder and longer wearing than the (DuraSponge) softer and quieter rubber used up front, both rubber compounds are very well suited to their intended uses. Each of these two models uses different foam, the GT uses their best EVA foam and the Kayano uses their newest FlyteFoam that is claimed to be 55% lighter than standard EVA foam. Both models continue to rely on the silicone-based gel for serious cushioning. The weight of these two models was a surprise, the Kayano weighs more than the GT! I weighed these shoes several times and even inspected for rocks or perhaps mud on the Kayano to make sure of an accurate reading. The GT 2000-5 weighs only 368 grams and the Kayano 24 weigh in at 372 grams! The Kayano has a new type of mesh that is a bit softer and compliant than the mesh on the GT. The Kayano also has a more plush collar and slightly softer sock liner/insert. The Kayano 24 has an excellent exoskeletal structure on the outside of the heel to keep your heel from slipping, it works a little bit better than the GT. The trademark Tiger Stripes have been removed from the medial sides of the Kayano. There seems to be no difference in performance between the two models, they ride the same, look alike and I cannot feel any difference between the two models on my daily easy paced 5-mile runs. 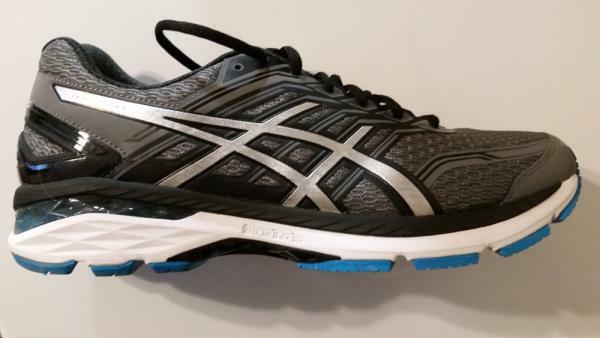 I am using the GT 2000 5 and Kayano 24 on alternating days and have not been able to detect any differences between these two shoes, they feel and even sound the same. I bet that if I used the GT on one foot and the Kayano on the other I would not notice the difference, however other people might. They are both purposeful and well-designed shoes with cushioning that is actually better than the charts indicate due to the way the Gel acts when you run. 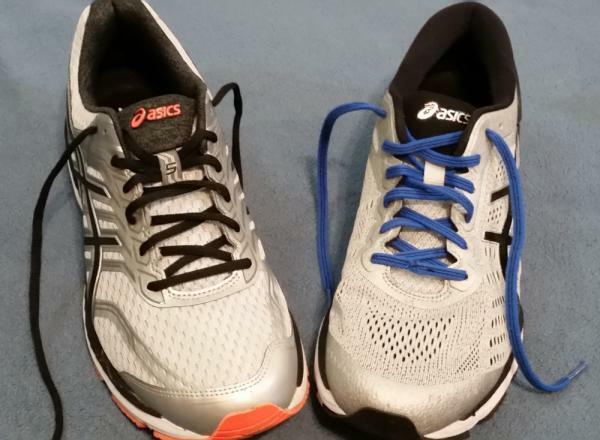 I recently completed the U.S. Air Force Half Marathon in Dayton, Ohio with shoes lighter than I should have, and this was a mistake for me, I really missed the cushioning provided by the heavier models such as the Asics GT, Brooks Ghost or even the Brooks Revel. Visions of the Brooks Glycerin kept running through my mind (Christmas is coming). These are both great shoes with the highest quality materials and workmanship and with the same strengths of durability, comfort, and performance. Both shoes also share the same shortcomings of being a little stiff for some runners, and perhaps a little heavy for some and too narrow in the forefoot for me. The Asics Kayano 24 is a testimony to the fact of how difficult it must be to make a shoe that is better than the GT 2000 5, more money can be spent, but try as they do they cannot get a better mesh, foam, gel or rubber than what is used in the GT. Thanks for stopping by, now go run! Asics claims GT 2000 5 are shoes that are solid, reliable and won’t let you down on long runs and I completely agree with them. As soft as a pillow they still give you back all energy you would lose running on a sandy beach. Forget about fixing your shoelaces again, about overheated feet, unbalanced ride and about changing your mind and go shorter today. No way! You will be willing to put them on again and again and again unless… you like to run faster. Perfect fit provided you got the right size. Usually, I wear a size 10 UK but these I bought in 10.5 and very happy with it (in 10 they would be too small). It seems that to prove shoes become lighter, Asics (and some other shoe-makers) are making slightly smaller shoes every next generation, so after 2-3 years customers will have to buy a size or two up. Few black nails during breaking in period (60-70km) but none afterward. Bought them for cushioning and protecting my legs from the impact of tarmac roads and they exceeded my expectations. Before I was running in Asics Gel-Zone (4), my weekly mileage went above 50km, but I started feeling pain in various parts of my legs. 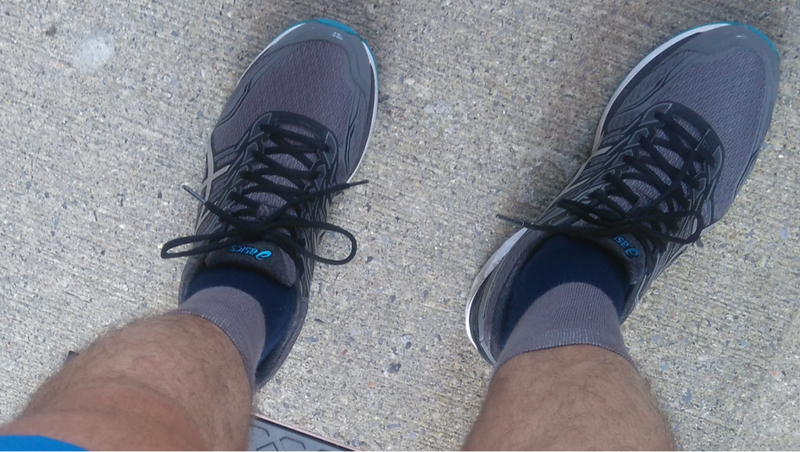 When I got GT 2000 5, I started rotating shoes for shorter distances, and after the break-in period (3-4 runs), I started using them for my longer runs (15km and above). After a week or two (since rotation started) all pain in my legs were gone, and I'm now using my older shoes for longer runs again from time to time. Initially, I was surprised I didn't get any Personal Best (P.B.) in these (new! expensive! Asics!) and my hope was it was due to a breaking-in period. But since I started to rotate shoes, I have the opportunity to compare the performance of GT-2000 with my older Asics. I must admit GT 2000 5 is slower than my older ones for around 7-10 sec per km. Attaching a graph showing my average pace running Half-Marathon on the same track for the last 4 months (ending on 12-July-2017). Lines: Red line goes through the activities I did in GT 2000 5, and the dark blue line goes through ones I did in my older Asics pair (Gel-Zone). For completeness: Light blue line shows my overall average pace on the given course running Half-Marathon. Stars: Red star is marking my pace on the other course done in GT 2000 5 (also a Half-Marathon on July 4), and a blue star is marking my pace on the same course, the same distance just a few days before (on June 29) in my older shoes. As you can see it is hard to call GT 2000 5 the faster shoes seeing them slower 5 to 15 seconds than my older ones. Very durable. After 300km no issues whatsoever, the insole, outsole, all parts of the shoes are still intact. The Sole of the GT 2000 5 is shown on the picture on the right-hand side. It has minimal tear after going 3 hundred kilometers over sand-paper-like tarmac and concrete roads. These are long distances, and when you get tired, you sometimes put too much stress on them. The sole of the other Asics after 1500km of running is shown on the left. Since it is made of exactly the same material, I hope to get the same mileage from GT 2000 5. Great for training but not for a race you want to go fast in. If you like to train for Marathon on hard tarmac roads, they are superb for protecting your legs, and you can do as much as 100 km weekly with no problem. I'd say they will even cure your legs if they suit your stroll and arch type. While they will perfectly save your legs during the Marathon, I wouldn't run a Marathon in these going for a P.B. as they might make you slower. Chances of burning out yourself too soon are also high. These sneakers are wide enough to provide a comfortable fit for ladies with painful bunions, and will help reduce the risk of friction between the foot deformity and the inner part of the shoes even during intensive running. Not much has changed in the Asics GT 2000 5 compared to the last model. In the latest edition, what is most apparent is the new seamless upper. The no-sew construction provides a more adaptable fit that also reduces the risk of irritation or hot spots. Asics added a sturdy toe cap in this model for more durability and enhance toe protection. While a prominent toe protection is added, the very thick and stitched eyelet support has been removed. The new welded eyelet support provides decent support without adding weight to the shoe. The new mesh gives more support and comfort to the user in the GT 2000 5. It does not have the large holes of the earlier version, but it makes up for it with its countless holes to maintain the shoe’s breathability. Finally, a more structured Heel Clutch System locks down the foot. The fit of the newest instalment of the Asics GT 2000 5 mirrors that of the prior model. There is a decent space in the forefoot to accommodate even those with flat feet while the heel and midfoot have superb security and support that is not restrictive. Runners with medium to slightly wider feet are naturally built for this kind of fit. It runs true to size. The outsole is a classic Asics underfoot design. It features a very deep vertical flex groove called the Guidance Line that helps with the transition from landing to take off. This vertical flex groove merges with horizontal grooves in the forefoot for increased flexibility, which is badly needed in a shoe that has more than enough cushioning and support features. In the forefoot, a blown AHAR rubber, the Durasponge, delivers good traction and durability. And just like in the popular Asics GT 2000 7, the shoe's heel and other high-wear areas continue to use the very durable AHAR rubber for durability. Asics utilizes its proprietary FluidRide construction in the GT 2000 5 for that optimal combination of shock-absorbing and responsive features. By putting its brand-exclusive SpEVA on top of its Solyte foam, the shoe delivers top of the line cushioning that does not take away the needed bounce back features. As these cover the entire length of the shoe, the movement from landing to toe-off are also improved. The forefoot and the heel use the award-winning, silicon-based Gel Cushioning System for more shock-absorbing and cushioning abilities. Shoe integrity and support are enhanced by the TPU material in the midfoot known in the Asics lingo as the Trusstic System. The seamless upper of the 5th model of the GT 2000 starts with a very breathable and comfortable form-fitting mesh. It basically wraps the entire shoe to ensure breathability. Asics incorporates new overlays in the midfoot to form a network of support with the Asics logo for better midfoot security and support. The tongue and ankle collar have moderate padding for comfort. A traditional lace-up closure keeps the fit snug and supportive throughout.